This Wednesday, May 11, is a do-or-fail moment in history for the flight of the human-powered helicopter. 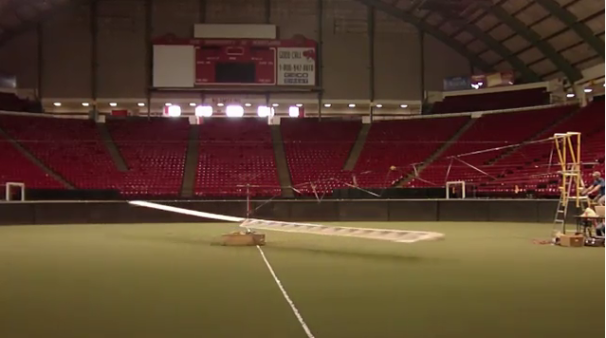 Christened the Gamera, the machine is the work of a team of 50 A. James Clark School of Engineering students and other staff from the University of Maryland who have spent two years developing their machine. The Gamera itself is about a third of a football field in size, with a 60-foot cross-beam frame attached to four rotor blades, each sweeping a diameter of 42 feet. The rig is made from lightweight materials such as balsa, foam, mylar, and carbon fiber, and weighs 210 pounds including the pilot. Speaking of which, the entire thing will be powered by the hand and foot pedaling of one student. According to Dr. Antonio Filippone, Professor of Aerospace Engineering at the University of Manchester, the female pilot will need to produce a thrust force 15 times the weight of the machine to overcome the drag from the blades. The record to beat is the Sikorsky Challenge, and $250,000 in award money on the line, which entails having a fixed-wing aircraft, solely powered by a human, hover at least 3 meters off the ground and to remain within a 10-cubic-meter box for at least 60 seconds. The American Helicopter Society originally put forth the challenge in 1980. The current record holder for any human powered fixed-wing flight is the Yuri 1, created by the Nihon Aero Student group in 1994, which hovered at 8 inches for 19.46 seconds. Gamera will be taking flight this Wednesday between 6 a.m. and 9 p.m (PST) and the whole thing will be streamed live.